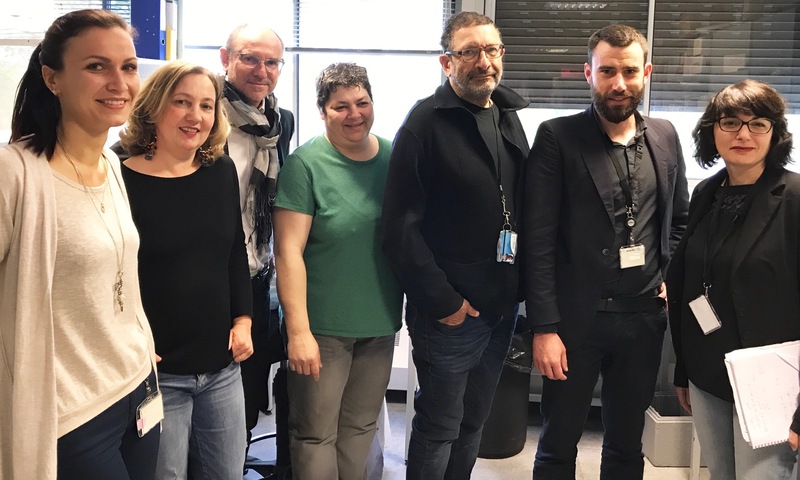 The BBB and Neuroinflammation team lead by M. Khrestchatisky was created to expand the laboratory’s potential to study neurodegenerative diseases and neuroinflammatory processes at the neurovascular level. Indeed, the CNS is endowed with a finely tuned microenvironment that relies upon the integrity of the BBB. Most CNS diseases are associated with BBB inflammation involving nitric oxide, products of arachidonic acid metabolism, and the expression of a variety of cytokines, adhesion molecules, serine and metallo-proteinases etc. One of our objectives is to understand the role of the BBB during inflammation in general, and specifically in the course of neurodegenerative diseases, which is paramount for the development of therapeutic strategies aimed at controlling the deleterious effects of inflammation. We use in vitro BBB models and animal models of neurodegenerative diseases to study the effects of pro- and anti-inflammatory molecules on BBB properties, in different pathological situations. Another general objective of the team is to exploit the knowledge and technology generated on the BBB, notably in the context of inflammation, to address CNS drug delivery across the BBB. This objective is pursued in close interaction with VECT-HORUS, a biotechnology company spin-off from our team and dedicated to translational research and transfer. In partnership, we develop vector molecules that facilitate drug transport across the BBB, and novel therapeutic drugs based on the conjugation of our vectors with off-patent or proprietary drugs and imaging agents. The mammalian brain is a complex network of neurons and supporting neural cells such as astrocytes, microglia and oligodendrocytes. 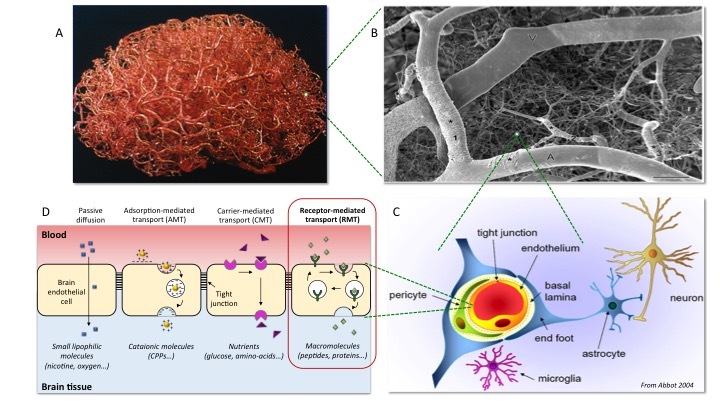 The brain is also endowed with a unique vascular system that irrigates the nervous tissue, through a dense network of brain capillaries composed of brain endothelial cells. The total length of capillaries in the human brain is approximately 600 km and they represent a huge surface area of about 20m² providing exchange between blood and the nervous tissue. This exchange is highly regulated and the brain vascular system provides exquisite protection of the nervous tissue in physiological conditions by restricting very effectively the passage of toxic molecules, infectious agents and peripheral cells from blood to nervous tissue. The drawback is that this brain vascular system also prevents the passage of more than 98% of the drugs developed to date. Due to its properties, the brain vascular system is known as the "blood-brain barrier” (BBB). The BBB & Neuroinflammation team studies alterations of the BBB that occur in neurodegenerative diseases, in particular its inflammation associated with the loss of its fundamental properties that contributes to pathology. Alterations of the BBB lead to a more permeable vascular system allowing exposure of neurons and neural cells to pathogens, toxic molecules, and excess immune cells that are normally restricted to the periphery. In partnership with VECT-HORUS, a biotechnology company spin-off from our team and dedicated to translational research and transfer, we also exploit the knowledge and technology generated on the BBB to address drug delivery into the brain. We develop “vector molecules” that we conjugate to off-patent or proprietary drugs and imaging agents to facilitate their transport across the BBB. Our objective is to improve the brain delivery of imaging and therapeutic agents, in particular large “biologics” such as antibodies that are gaining momentum in the therapeutic arsenal, to improve their efficacy and the perspective of treating devastating neurodegenerative diseases. A- Vascular system of a human brain. B- Electron microscope picture of the brain vascular system with arterioles, venules as larger vessels and the dense microcapillaries that are a major part of the BBB. C- The capillaries are composed of endothelial cells in close interaction with pericytes and astrocytic end feet. Endothelial cells establish tight junctions between them that contribute to BBB impermeability. D- Brain endothelial cells allow the selective passage of different classes of molecules. Receptor mediated transport or transcytosis (RMT) is one of the physiological mechanisms of brain endothelial cells that allows transport of large cargos (proteins, particles) across the BBB, and that can be used to deliver imaging agents and drugs, for instance therapeutic antibodies, into the nervous tissue. Scheme of the RMT process used for drug delivery across the BBB into the nervous tissue. Endothelial cells (in yellow) establish tight junctions between them and most drugs (D) do not cross the BBB. We develop vector molecules (V) that have high affinity for specific receptors of the BBB involved in the process of RMT. These vectors can be conjugated to imaging agents or drugs to facilitate their transport across the endothelial cells and hence across the BBB, into the nervous tissue. The specific objectives of the BBB & Neuroinflammation team are to pursue ongoing collaborations with the other INP teams addressing: i) BBB inflammation in neurodegenerative diseases, APP processing, cytokines and the role of the MMP/TIMP system (S. Rivera team); ii) neural stem cells and induced human pluripotent stem cells (hiPS technology) for the development of human in vitro BBB models (F. Féron and E. Nivet teams); iii) gliomas, tumour processes (D. Figarella-Branger, L’H. Ouafik, H. Kovacic teams) and targeted anti-cancer nanoparticle design and development (D. Braguer); iv) imaging of intracellular trafficking in endothelial cells (C. Leterrier team). The BBB & Neuroinflammation team and its partners pursue their research at different levels of integration, ranging from chemistry and drug design, molecular and cellular neurobiology, to the most integrated studies with animal models of pathology, behaviour, learning and memory (F. Roman team), and preclinical studies. Transfer and valorization for the team’s research are optimized by the original structure of the INP as a “Laboratoire Commun de Recherche” (LCR), which integrates the academic teams mentioned above and VECT-HORUS. PIs: P. Benech, L. Ferhat, M. Khrestchatisky; collaborations with S. Desplat Jego, S. Rivera, E. Nivet, partnership with VECT-HORUS. We pursue our studies on the transcriptome/proteome of diseased brain microvessels prepared from animal models of neurodegenerative diseases, at different stages of the pathology, and from CNS endothelial cells in culture (in vitro BBB systems), treated or not with molecules that modulate inflammation. Molecules of interest and critical signalling pathways are identified using systems biology approaches. With VECT-HORUS, we also pursue the development of in vitro BBB models based on hiPS stem cell technology that will allow implementation of such models based on human cells. These cells can be derived from patients, and we are developing co-culture models of the neuro-glia-vascular unit (collaboration E. Nivet and S. Rivera). Results obtained in vitro will be confronted with in vivo data obtained from brain microvessels of animal models and from human. Receptor-mediated transcytosis/transport (RMT) is considered as the safest and most efficient strategy to transport drugs or imaging agents into the brain. Different laboratories and biotech companies have focused on a “first generation” family of receptors expressed at the BBB, but also in organs of the periphery, draining vectorised molecules and potentially eliciting secondary or toxic effects. There is thus a need to identify “second generation” receptors that are expressed at the inflamed BBB and as BBB-specific as possible. In collaboration with VECT-HORUS we pursue our studies on the transcriptome/proteome of CNS endothelial cells from animal models of neurodegenerative diseases and from human in vitro BBB models based on iPS technology. Brain endothelial cell receptors identified as targets of interest are being validated. In parallel, we also implement high throughput screening of stable cell lines expressing receptors of interest and purified receptor domains with peptide and nanobody libraries to identify molecules (hits) that bind the target receptors (NANOVECTOR ANR project). Finally, we develop and optimize peptide or nanobody hits as bona fide vectors and evaluate their transport potential across the BBB. Once validated (efficacy, BBB-specific, non toxic), novel vectors are conjugated to imaging agents or drugs of interest, either off-patent organic drugs, bio-molecules (siRNAs, endogenous peptides, enzymes, antibodies), or proprietary molecules of the biotech and pharma industry. Conjugates are assessed for their potential to cross the BBB and reach the nervous tissue to elicit efficacy. They will be further developed as new chemical entities up to preclinical studies before licensing to pharma or biotech partners. Michel Khrestchatisky gave a talk on the ongoing projects of his group and biotechnology partner Vect-Horus, also member of the ECMED consortium, while Grigorios Kyriatzis presented results of his ongoing PhD project.